The Master Gardener Volunteer program is designed for those who want to learn more about gardening in order to share their knowledge with others. It is a program to train horticultural volunteers who will assist Extension in sharing horticultural information with the public. The sessions build on your knowledge base of general horticultural topics while also providing interaction time and discussions of locally-oriented issues within the main topic. Master Gardener Volunteer certification involves attending training sessions, volunteering 24 hours of related community service, and completing a take-home exam. Whether you like working most with people or with plants, there are activities that you can do to fulfill the volunteer hours requirement. The registration fee covers the instructional materials utilized during the course. The instruction is repaid by the volunteer hours you perform during or after course completion. This day-long event inspires everyone to think spring and learn new tips & tricks for the coming season. This program of educational classes is for the public held at UW Marinette Campus. Join us in this exciting community event. Gardens of all types will be showcased. These gardens will dazzle you with their fabulous displays of flowers, intrigue you with garden art/ structures and inspire you with vegetable gardens and fruit orchards. Applesauce, apple cobbler, and apple pie are just the start of the wondrous foods that utilize Wisconsin’s favorite tree fruit. In addition to discussions on apple harvest, preservation, and cooking tips, we’ll taste test different apple cultivars & numerous apple incorporating recipes. Attendees are encouraged to bring their own favorite apple based treat. The family event for kids of all ages. A few spooky things to keep you guessing, and enough activity choices to keep all family members busy and active for your entire visit. Hands -on nature crafts and pumpkin carving for children and adults. A local 4-H group will have refreshments available for purchase for a club fundraiser. Annual all-you-can-eat and family-oriented activities event. Check out Breakfast on the Farm Facebook page or the website for more information. UW-Extension office educators will again have an extensive display of the many areas of expertise that they offer to the public. Northern Lights Master Gardeners will also be available for horticulture questions. 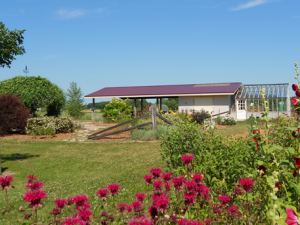 If you are in the Marinette area, take some time to visit our demonstration gardens which are part of the Harmony Arboretum @ N3890 County E, Peshtigo, WI. The Master Gardeners’ display and demonstration garden is a 3-acre area protected by a wildlife-excluding fence. It is always open to the public – but please close the gate!